MAAC offers a wide range of career-oriented courses in 3D Animation, VFX, Multimedia, Graphic and web designing, gaming, and media and entertainment. 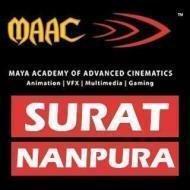 MAAC conducts classes in Animation & Multimedia, Digital Film Making and Film Making. It is located in Surat, Surat. It takes Regular Classes- at the Institute.